I have vaguely mentioned some skirmish rules that I have been working on in the threads that have my minis in them, and I have a working draft of the rules now. I’d really like to get a few (3 or 4) people to read them over and offer some (ideally detailed) feedback. Anyway, it’s starting to seem like I am asking a lot, but the people that are on this board are the kind of people that would be interested in playing (and maybe even purchasing) a print and play game with paper minis and all that. I’m still a little ways out from play testing (I am knee deep in making the second faction’s minis now), and the game is more or less unplayable without the minis and the stat cards. However, those that get in on reading the rules now will be at the top of the list for play testing (if they are interested after reading the rules). As an incentive for play testing I plan to ship pre-printed copies of the minis (and other components) to save play testers ink and paper (though you will have to assemble them yourselves). Additionally (though it is a small reimbursement) anyone who play tests will be mentioned in the credits and receive an electronic copy of the final version of the game (which may or may not be a freebie or available commercially, we’ll see what the overall reaction to it is). Anyone that’s interested let me know. Any questions ask ‘em here. To the guys at Sanity Studios… I was under the impression that this type of thing was still welcome in the forum, but if I’m mistaken and you think I am poaching in some way just let me know. grid maps or measured movement? My playing group have some skirmish fan, we can test it. If it is not too "adult" or "scaring" (images or "content"), i can play it even with my son (which may require translation, so i'm unsure about it). Fantasy skirmish (swords, bows and magic) with about 15-20 figures per player. Each mini acts independently though some units are added to the forces in groups (still acting individually). All in all it is more rules intensive than a fast playing game like Song of games (not to knock them they're super fun) but initial run through indicates the game play flows pretty smoothly (I am hoping to iron out any remaining kinks now before a proper play test begins). The rules are written for measured movement, but I have included a chapter that easily accommodates grid or hexes for playing. Fantasy, I am pushing for getting a playable version up and running before I work on the backdrop, but there is an original fantasy setting that I have tons of notes on that should make a decent back story for the battles. Now that the people I play with are familiar with the rules we run a two player battle in 2-3 hours. i would guess closer to 3 for new players. As above, we haven't started proper play testing yet so this is an estimate. This could vary based on your skill level and attention to detail, but you would need to assemble 15-20 minis per player to get started and about 40-50 minis to have the complete faction. There are also some counters, cards, and templates to make, but these are pretty simple (fold and cut). 2-4 is ideal, though in theory it could handle more players if necessary. Currently there will only be two factions available though, so 2 player battles or team battles would probably play out the best. 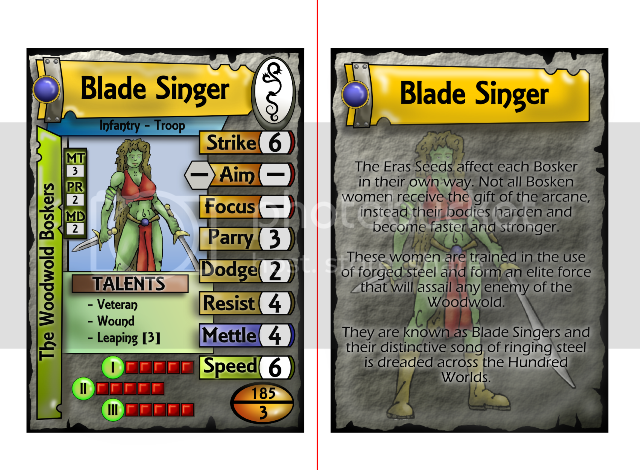 The cards themselves will be relatively text light, stat names (with numbers) and a list of special abilities. However, the rules clock in at around 40 pages and each faction would have a page or two of special abilities and spells. I'm not certain how difficult the language barrier would be (though it's clear that your grasp of English is better than my grasp of any other language). There is no adult or scary content (more than any other fantasy battle game) it isn't horror themed and all of the minis are clothed. Also, I'm not suggesting those that offer feedback are obliged to play test, but if there is a line of people waiting to play test (which may or may not be the case) I'll offer proof readers first choice. Thanks for the interest. I hope this answers your questions. Thanks Onemonkeybeau, message me with an e-mail address and I'll ship them off. Parduz, if your interested also message me and I'll send you a copy. Of course this is most welcome. The forum is a place for the community to come and discuss cardstock modeling (which your Print n' Play game definitely looks to be). I'd love to jump on the bandwagon and look over your game too but I'm swamped with thing I need to do (and things I want to do) already. The minis are lookin' good though and keep us posted. I figured this would be the attitude here (and I am happy to hear it), but I thought it better to ask instead of just assuming. Ok, i'll write here my first impressions. Pls think that, as i'm not native english speaker, i may have misunderstood something, or that i may have to learn a new world. Grit and Mettle: never heard these words before. A quick search on Wordrefence.com got me the meaning... but i think they should be changed in more common terminology. I understand that they give more "color" and feel than dull terms like "health", "toughness", etc., and i understand that non-english game market is really little, but i think at that words as the first "speed bump" i've found reading the rules. This is a things that happens on other ruleset based on army cost (from HeroScape to SoBH): I'd like a way to spend unused point in the battle. As example, every X unused point give a dice reroll, or -talking about this game- dice in the fate pool (basically meaning that your units are a bit more trained), or a single squad member reinforcement (when a unit of a squad dies, i can bring in another). Dunno how to balance them, but it will avoid the part of army bulding when you're doing math just to squeeze out the most figures from the allowed total, and will add a bit more "strategy". measure the distance the unit wants to travel across a slick terrain (it is allowed to stop in it), then roll that number of dice. For every die that does not show a 1, the unit MUST now walk 1 inch in that direction. Why the unit is forced to travel that distance? 'cause it have already measured it, and it does not allow to go prone in a strategical place. The advantage is that a single roll is made, similar to the hazardous terrain. as it is, fast units does not benefit from roads more that slow units. More, it does not allow to "run and hide" using roads (think at a sort of guerrilla in a village). I'd go for something like "every X inches on the road the unit gains 1 free inch of movement, which, if used, must be spent immediatly to move, even out of the road". I don't get the meaning of the armor rule. Is it not enough to say "add (left) armor dice to the Parry or Dodge test"? The split and combined attacks are my second "speed bump". But i'll read them again later, and i will stop here for now. I'd like to have the examples written in a different way (italic?) or maybe enclosed in a box with a defined background color, so i may search for them just fast flipping the pages. My first impression is that there's a lot of good ideas. The terrain "stats" are clever and very useful to customize everything. Hey Sammo, my little brother and I play skirmish games quite frequently and I would love to play test/proof read these rules for you. I myself am working on a Role Playing system and it would be cool to look at someone else's work for inspiration. Happy to have the feedback. Message me with an e-mail address and I’ll send you a copy. Sorry to make everyone send me an e-mail address but I’m not certain I want to just post these rules on the web just yet. Plus I don't want a thousand copies floating around. I doubt that you’re the dumbest reader I’ve ever had…. You seemed to get the gist of everything so far. In a way it is good to have a non native English speaker read them, it will give me a good idea of how clear the rules are. Interesting point, I did choose the names of the stats for more color, the idea being that I would separate my game from others. I never considered that common terminology makes the game more accessible. Anyone else have a thought on this? Is it more convenient to have common (maybe even bland terms) in a game to avoid confusion or do these titles actually enhance the game by adding flavor? I like this idea. I have the same trouble in point buy games. I’ll give this some thought, initially being able to buy extra dice for the dice pools seems like a good way to spend points, I’ll have to give some thought to point costs though to keep balance in the game. This makes sense to me as well. I’ll have to check out the movement rates and decide how much movement on the road seems reasonable to start accruing the bonus. As written now a unit can make a ranged attack against an adjacent unit. But the free attack rule also indicates that a unit might be firing at another target far away and an adjacent unit could make the free attack first. I am guessing by your response that you would suggest not allowing ranged attacks while in melee. I have gone back and forth a few times on this issue…honestly I think in the end you will not be allowed to make ranged attacks in melee without the special talent, but even with the talent you will suffer a free attack. Still unsure of how this will pan out in the finished version, I hope to receive more input on this topic. I think you misunderstood one part of the game or I didn’t explain it well enough. The parry and dodge stats are just numbers, you don’t test those stats. In the initial version of ITF the defense stats were tested against each attack, but it made game play too slow, so they were changed to a static defense (like a target number). The difference is that armor is an extra test that might protect those units that have armor, but doesn’t make a unit harder to hit. I’ve gone back and forth on this a few times, thinking it would be simpler to have armor factored into defense. As it stands now not too many units will have armor (it is not an ability that every unit has) so I think the special rule is okay, but I am not positive it is the simplest way to address armor. This might be a case of me struggling to get the rules into text. When played the combined attacks and splitting attacks are really pretty easy. If you re-read them and can’t make sense out of them let me know, I may re-work the wording. I’m pretty sure the rules here are solid (as solid as any of the rules anyway). I was considering something like this as well. I think alternate example “boxes” will appear in the final version of the game. Thanks (both for the compliment and for the time it takes to read the rules). I am fairly proud of the terrain system, so I am glad to see someone appreciate it. I've never played a skirmish game before so if you want a total newb take on the rules I'll give it a go. I also nit pick about spelling, grammar, textual inconsistencies and other things that annoy the hell out of my friends so maybe I can use that to your benefit. Sounds good, send me your e-mail and I'll send you a copy. I declare how much far i want to travel on slick terrain (say 4 inches) and i roll that number of dice (so, 4 dice). Each 1 is one inch less. I am guessing by your response that you would suggest not allowing ranged attacks while in melee. What i can't stand is the ability to shoot at the figure adjacent to you. I can't see how it could be done in "reality". I think you misunderstood one part of the game or I didn’t explain it well enough. The parry and dodge stats are just numbers, you don’t test those stats. In the initial version of ITF the defense stats were tested against each attack, but it made game play too slow, so they were changed to a static defense (like a target number). The difference is that armor is an extra test that might protect those units that have armor, but doesn’t make a unit harder to hit. It is fast and it works: this is how ship shields are implemented in Battlestations. The game is horrible (imho) but this thing works and I think it is very clever. Sorry, I don't get this. As armor dice cancels hits, it is not the same? What's the difference from "being hit" and "taking damage", talking about game mechanics? What I am getting at is that with the current armor system you only roll for armor if your unit is in danger of getting hurt. If an attacker rolls an attack and misses you don’t have to worry about the armor mechanic and play moves on without pause. On the other hand if a unit’s defense (either parry or dodge) is exceeded by an attack roll and the player is moving on to damage, the game pauses to record damage anyway, so tossing a few dice real quick shouldn’t slow things down too much. Your suggestion for the alternate armor mechanic (adding dice to the attack and then taking them away) intrigues me. I’ll have to give some thought to the armor mechanic, it may need some reworking. I do like the idea of armor being tied to dice (instead of a flat number for protection) but I am not sure if I like the way it is written now. At the same time I think that for the amount of units that will have the armor talent, the extra roll won’t be too distracting. Anyway in addition to this I am planning on retooling the slick terrain and road terrain mechanics. Additionally I plan to devise a system to allow players to spend their extra points in some way (but have not worked the details out yet). I’m still not certain if/how I will alter the ranged combat in melee rule. I can really see both sides of the issue, but I am not sure where I will settle in the end. @ arkhamresident, your copy has been sent. Message me with an e-mail address and I'll ship you a copy as well. Ok, i'm writing here while reading the rules. So i may throw some idea as they come out without sorting them in the post... this tiny box to write post is really.... tiny! An example with illustrations that cover a round before starting chapter 6 could be a great way to keep things together. May be you may split it in "steps": movement and terrain rules summary to be inserted before the combat chapter (even if some figures may have not moved 'cause charging or other actions which are not still be explained). Then the combat phase after the combat chapter. At the end of the book the reader have seen a full round. - Generic suggestion: it is too much work to build a rulebook made for screen? I'm reading it with my full HD monitor, but even with a standard 4:3 screen having it oriented in a landscape sheet format could help a lot in reading. I don't know what this means in term of reformatting the document, so i'm just asking. I feel the lacking of bonuses on the morale... er... mettle test from the Heroes. They provide a way to gain panic, but not to recover from it. It may be as it is for balance reasons, but, from a pure "hollywoodian" point of view, a Hero should grant some bonus against fear (LoTR trilogy anyone? ;D). I don't know.... i just feel the mettle rules lacking the support of the Heroes. SoBH uses a specific type of unit (Standard bearers) as a "meeting point" for rushing units. It brings out some interesting strategy for certain kind of units (undeads on top) which are otherwise mostly without use, but this is really tied to the system activation system and mechanic, so it may not fit here. Chapter 8.3: "Overwhelmed units can make for easy targets." Why? The -2D penalty is for test... why should they be "easy target"? When a spell have area effect, may i target a point on the terrain? I may have missed it, but seems to me that i'm forced to target figures, which may be not always the best option.... if yes, how it works? I should see some figure cards to tell you completly what i think... there's some points that i have in mind that are hard to explain for me and may be wrong as i don't have seen any unit card. - the amount of "marker" i may have to use. From reading the books seem that i'd need a lot of them, and this can bring some mess on the table. - The number of "exceptions" (Magic attacks cannot do combined attacks but can do splitted one, etc): i have to see how "hard" is to remember all that things. Also, moving all the units in my turn is not my preferred way: i'd like more a "splitted turn" (something like "i move, you move, i attack, you attack) or a limited number of actiovations (like Heroscape) but it is just an impression and the game may be perfectly fine as it is. Anyway, i see you putting a lot of efforts and time in this game. It seems a good one, and sure it have some original, clever and amazing ideas in it. - Generic suggestion: it is too much work to build a rulebook made for screen? I’ll see how this works out next time I am messing with formatting. In general I was under the impression that landscape was undesirable for printout, I never thought about it for screen viewing though. If it is easy to do I will create a landscape version of the PDF. What bonuses stacks? what not? A bit lost here (again...sigh). I recently received this comment from someone else. I will clarify how the bonuses stack or don’t stack as part of the revisions. The rules are there but it really isn’t spelled out very well and would be difficult to look up real quick in the middle of a game. Included in the final version will be a reference sheet that should offer a decent summary of these rules for play. I feel the lacking of bonuses on the morale... er... mettle test from the Heroes. Heroes are addressed on an individual basis with talents. For example, there is a leadership talent that allows other units to benefit with respect to morale. Likewise another talent will allow units to have a bonus to attempt to rally. I decided to make a distinction between hero and leader…Heroes are just powerful unique combatants, and leaders are heroes that can bolster their troops with special talents. Oddly enough, I chose to effect all squad members with the death of a hero for a Hollywoodian reason, heroes are so noteworthy that their death ripples across the battlefield like a wave. I hope it doesn’t sound like I am avoiding this comment, but I think when I provide you with the unit and talent info, it will be more obvious that I did not ignore this concept, though that doesn’t necessarily mean that you won’t still have a comment about it . It isn’t specifically mentioned, but area of effect spells can be targeted anywhere the caster chooses, centered on a unit or not (in range of course). I’ll clear this up as well. I should see some figure cards to tell you completely what i think... there's some points that i have in mind that are hard to explain for me and may be wrong as i don't have seen any unit card. Unit cards are in the works, I’ll send everyone that e-mailed me for rules a copy of a sheet that has a draft of the unit stats on it for one complete faction, so everyone can get an idea of what a unit is like. The battles I have played aren’t too terribly clutter (usually because once a unit begins to gain a bunch of counters it is quickly killed off). The one exception is the mettle counters which are handed out frequently and can be a bit of a nuisance. The only solution I found for this was to either resolve mettle whenever it came up, which interrupts game play, or to track it on a card, which was too easy to overlook compared to a counter. On a side note I do have a complete set of counters for the games, so you won’t have to use makeshift tokens. I tried to keep the overall exceptions to a minimum, but yes there are some parts of the rules that are a bit off the norm. I had a specific reason each time I did so, usually to preserve game balance or to have something make sense to me (of course just because I had a reason doesn’t mean it is the best way to do it). It is my intent (as mentioned above) to have a reference card that will offer enough information at a glance to keep the game on track. I think this particular comment really comes down to personal preference. Some like moving a few units at a time and others like an all out move and act system. I prefer having all units at once, but once again this is personal preference. Okay, everyone (who gave me their email) should now have a copy of the rules and a sample unit list. Keep in mind that the unit list is by no means a final version; one of my current tasks is finalizing unit stats. If anyone has not received both these things let me know. I realize now that I may have sold you all a bit short, considering there are no descriptions of any of the talents. I’m working on finalizing this list as well. I left these intentionally out of the core rules so that I could easily include new or modified talents with each new faction. Just keep in mind that special abilities are included in the game, just not described in the core rules. Also, here is a link to download the counter sheets, the counter blocks and the area of effect templates so you can get a look at those and let me know what you think. I chose to effect all squad members with the death of a hero for a Hollywoodian reason, heroes are so noteworthy that their death ripples across the battquotelefield like a wave. Just adding an exclamation mark will help, then. I may be wrong, but it seems to me that it was the only, or the first, color note until that point... i mean: i was not expecting it. You may think to write more of them scattered around the book (to keep me "used" to read them) or removing the few at all (talkin' anbout the "rules" chapters, the final part of the book is good as it is). I think this particular comment really comes down to personal preference. Okay, everyone (who gave me their email) should now have a copy of the rules and a sample unit list. Why AIM and FOCUS have been raised to the "stat rank" instead of "just" talents? I mean: defining the spellcasting talent as "Spellcasting " give the same infos. The general concept i have behind this is that a stat should be a common, universal feature; if a stats can be 0, it is not a stat but a talent (like the stats and skills in D&D3.5) (also, this will "enforce" the rule that a Stat test must have at least 1 die: some dumb ppl may argue that this should be true even with a stat at 0) . So i'd put Aim in the talents too (Aim [5,L]). I see that it may be a bit less visible, but it seems to me more "coherent" or "formal" (these are not the right words, but i can't sort out the right ones). Stupid question: what is the font you used? Is it free? So the easy question first, the font is Estelle Black SF. I have no idea where I got (probably with microsoft office), so I don't know if it's free or not. As for making aim and focus talents...originally spellcasting was a talent with a rating that served in place of focus, but for early card draft it was changed to a stat mainly because all the attack and defense stats were there (parry vs. strike, dodge vs. aim, resist vs. focus). 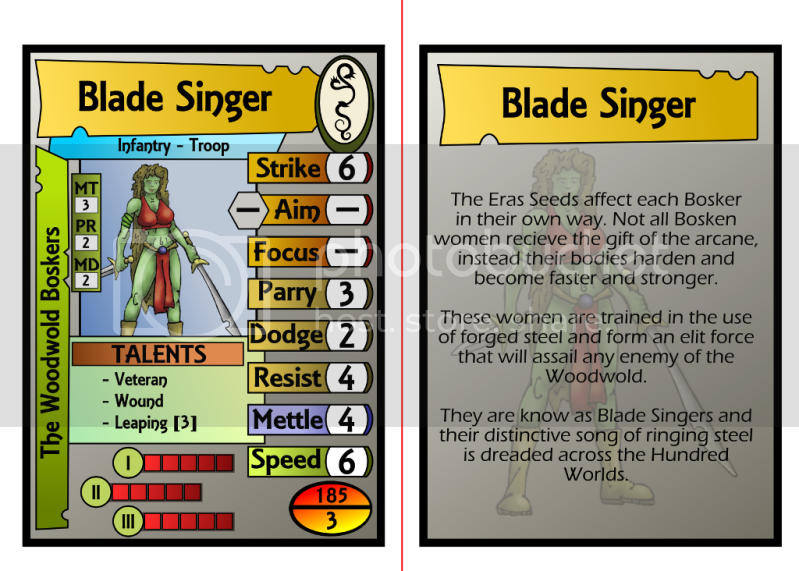 I am still considering removing the focus stat, we'll see how the sample card goes over (see below). As for aim, I think it will stay a stat. We found it an easy and visible way to flip through the cards and see who can make a ranged attack (as you said, it is more visible). Still I will wait and see what the reaction to the cards is. Have a look, this is my first draft of the unit card, so now is the time to pipe up with advice. The words on the back of the card on the PDF tend to blend in with the figure... the card in the preview in the post above is much more legible. Might have to do with the background color too. I'm really excited to see where this leads! I'm still perusing the rules but Parduz has asked all my questions already Great job Parduz! If I have any more, I'll shoot them to you here. Glad you like the cards. I agree, I prefer the more “lived in look” as well (especially for fantasy), but it is easy to play with shape and color in Inkscape and gradients. I hope to make these cards look a little more natural before the final product. Thanks for the catches on the back of the card, goes to show my dependency on spell check. I’ll have to make sure to run the flavor text through Word before I plug them into Inkscape. I also didn’t realize I had the tan color in the PDF until now. I prefer the gray for the contrast (both for the text and the rest of the colors). Thanks for checking the game out. Things are going along pretty well. My biggest task now is finishing up a second faction worth of minis and finalizing the cards. Although, I could use this sample card to produce unit cards for play testing. Everything else should be pretty basic to get ready for play testing (at least, there is a lot of polishing to get ready for a proper release). As you are reading the rules I wouldn't mind a second opinion on the armor mechanic and being able to make ranged attacks in melee. These are tow things that parduz brought up that I ma a bit undecided on and would enjoy another point of view. So, I worked on the unit card (and some new minis) quite a bit this weekend. I'm keeping the minis under wraps until I have the whole faction done, but here is the new sat card. The layout is identical, but there was effort put into texture and shading that I think really paid off. Let me know what you think. Well, your efforts really pay! The only thing that bother me a lot is the "cost/#" pill in the bottom. It is alone, different to whatever else, and without description. I have to think at it to recall what it is means.... I'd place it on the top: Card name, type, faction, cost and number of are, to me, a group of infos that have to stay together, so i'll place all in the left/top sides. - I will make the title space less high, so the drop shadow will not cover the type infos (if you don't plan to write two lines). - Do you really need to specify "Talents"? It is the only field with a "caption" (the stats needs it 'cause they're "a lot"). I think you should remove it, or write a caption for the others field. Aren't the card meant to be "secret" until the beginning of the game? Of yes, why the name in the back of the cards? Or have i not understood the "building" phase? About the font: if it is not free, this means that making custom cards can't be done freely, or they have to be really different from officials ones: is this what you want? I’m glad you like the card parduz. I’ll give some thought to moving the cost/# pill to the top. One of the things I am struggling against is the room I need at the bottom for the damage tracks (It’s not a big deal on this card, but on some units I will need seven tracks). I may change the shape of the pill a bit so it tucks in a little more up top (we’ll see how it works out). I did make the title bar big enough to handle a large name and a subtitle in smaller text. But I am thinking that if I get rid of the “Talents” title like you suggest and shrink the title bar just a little, it will free up some room and I can slide the unit type down a bit and out of the shadow. As for the straight lines, this is one of the things that still bothers me, and I will probably tinker around some more. Especially with the stat boxes, which are so regular. If I can find a way to muss them up a bit without making things to cluttered I will do so. I haven’t actually played with cards yet, so during the building phase we are just working from the roster I sent out and jotting down a list (so there is no stack of cards to give away your choice of forces). I may change the back of the card, it would be fairly easy to ditch the name and the image to make them all blend together. I’ll see how this shakes out. As always thanks for the interest. I just showed the new card to my wife and her first impressions was, "it's busy"
I thought about that for a while and I tend to agree. I then went off on a search through Googleland to see what others have done. Too, what's keeping us from turning the card sideways, like this one? Hope these help the creative process... I really like where you're going with this! ...her first impressions was, "it's busy"
I have to say that, after all the example shown, i tend to agree. While it may be true, just don't go too far in the opposite direction... some of my friends ceased to play Hybrid 'cause they was no more able to read the cards! Now, joke aparts: icons on cards are a way to take less space. The drawback is that you have to remember what they means. I remember other cards (don't remember the game, sadly) where the numbers was "color coded" (red-life, blue-mana, etc..). In our case, the stats are a bit too much to be feasible...maybe the best solution is vertical text. Thanks for the feedback guys… (and the examples). These cards look quite a bit better than mine (obviously) and I like the less busy look, though I think I am also trying to squeeze a bit more info on them than on these cards. I have been mulling over the crowded look as well, so I’m going to do some reworking. Let me know what you think about these potential changes to free things up a bit. 1) Remove the talent box, as parduz suggests it is unnecessary, it will be obvious that the list is the talents. 2) Remove focus as a stat. As suggested (also by parduz) this rating can easily be included in the spellcasting talent (spellcasting for example). I still think I will leave aim as a stat, it will be more common than spellcasting and I like seeing at a glance if a unit can make ranged attacks. 4) Combine the faction banner with the small faction logo to save the empty space and keep the faction identifier as a single (albeit multi part) item. 5) The title box will receive a resizing as well as the more I look at it the more I think it tends to dominate the card. 6) General text shrinking, though I don’t want to go too small as well. One of the reasons the text is so large is a overreaction to my frustration with cards that have tiny text, I’ll try and find the happy medium. Is the faction name (in text) necessary or is it sufficient to simply put the faction logo for identification? Abbreviation- I tried to keep abbreviations to a minimum, thinking it is much better to simply see the word. But in looking at some other wargame cards (like warmachine) they use a small stat box to keep the clutter down (see some here www.dungeontrader.com/store/stat.cfm ). Would you prefer a stat box over the list of stats?